It’s Friday so it’s unsubtle hint time. The Glen of Imaal Terrier DNA archive has been running a while, yes of course you’re going to send along DNA, but have you done it yet? And of course we’re going to fill in the 2018 Glen Breed Survey but where have I put it? So to aid memory. The online Survey can be found here. The following has to be written now so go and put the kettle on or something. No personal data in any form is harvested via the survey unless you choose to enter it yourself; neither isp, country or server used is recorded. 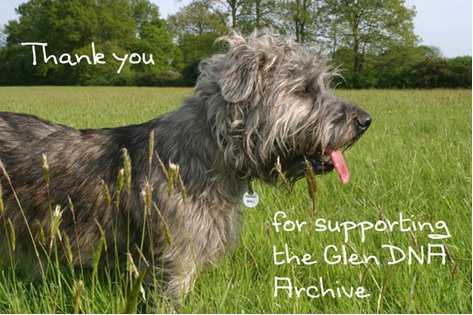 Thank you to all the Glen owners from around the world who have supported the archive … your submissions are greatly appreciated. Hopefully, many more owners will request a swab kit from the AHT and contribute to this invaluable resource!